This commissioned chapter is part of a groundbreaking volume on cheap print from leading authorities on popular literatures, cheap print and politics, which makes a position statement about the current status and locus of scholarship in this field across the UK and the USA. Publication in this volume is in itself an acknowledgement of McShane’s knowledge and scholarly expertise in examining broadside publication of the early modern period. McShane’s chapter lays out the immense breadth and variety of the broadside as a product genre in early modern England, and highlights its uniquely dynamic social presence. Far more than a survey piece, the chapter makes an original argument about the 'cultural economics' of the broadside, calculating as far as possible the production, retail and wholesale costs of broadsides through an extensive analysis of the print record in the Stationers’ Company and local and national archives. 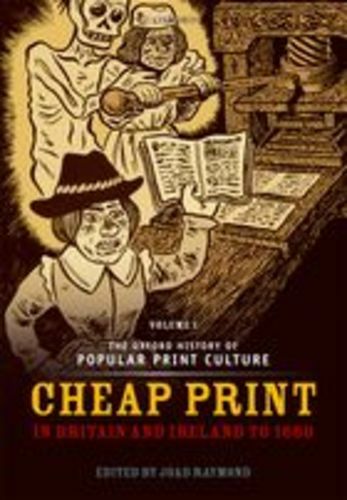 Crucially, McShane’s chapter argues for a move away from the less useful designation of 'cheap print' as a social or cultural marker, towards the categorisation of print products as 'retail' or 'commissioned'. The significance of this shift lies in creating a more useful conceptual tool by which historians might distinguish between products that had to compete in the open market, engaging the tastes and interests of the broadest possible audience, while potentially representing aspects of popular taste or opinion, and those seeking to impose social, religious, political or cultural authority from above. The Oxford History of Popular Print Culture set out to establish the ground for future debates and examinations of the role of cheap print in early modern Britain. In recognition of this, it was awarded the Sixteenth Century Society's Roland H. Bainton Prize for Reference Works in 2012.